For most readers, the term �cozy mystery��the light-hearted side of the genre�evokes a rural image. That�s certainly true of my Food Lovers� Village Mysteries, set in Jewel Bay, Montana�a lakeside resort community on the road to Glacier National Park that calls itself �the food lovers� village.� Fictional, like many cozy towns, but pieced together from towns and villages across the continent. In my new Spice Shop Mysteries, debuting this week with ASSAULT AND PEPPER, I decided to explore the urban cozy. To me, the core of a cozy mystery is the community. Murder disrupts the social order of the community. The amateur sleuth investigates because she has a personal stake in the crime and in making sure the right people are brought to justice. She may think law enforcement officers are on the wrong track, or her role in village life may give her insight and information they lack. The professionals� job is to restore the external order by making an arrest and prosecuting. Hers is to restore internal order within the community. The sleuth often runs a key local business�she may be the librarian or bookseller, the baker or caf� owner. She may be a native or a newcomer. In the Food Lovers� Village series, Erin Murphy is a bit of all those�a native who returns home and runs a market specializing in regional foods in her family�s hundred-year-old grocery. It�s work she loves, and it involves her deeply in local life. In an urban cozy, the community is a subset of the city, and the protagonist is a major player in that world. In Cleo Coyle�s Coffeehouse Mysteries, Clare Cosi runs a coffeehouse in New York City�s Greenwich Village. Clare�s employees, customers, and neighbors loom large, and many stories follow characters she meets through the coffee business�a customer and father of an erst-while employee who plays a charity Santa, a killer with a grudge against small roasters. Sheila Connolly chose Philadelphia�s many niche museums for her Museum Mystery series, featuring a professional fundraiser, while Laura Childs� Scrapbooking Mysteries plunge her cast into the craft-and-costume loving scene in New Orleans. And Julie Hyzy�s White House Chef series may involve the most closely-guarded community-within-a-community of all: the White House and the hundreds of aides, legislators, tourists, and international guests in and out its doors every week. My Spice Shop Mysteries are based in Seattle�s Pike Place Market. It�s the perfect city-within-a-city. The property is owned by the city but managed by a public development authority. Founded in 1907 and placed on the National Historic Register in the 1970s after a citizen�s initiative, it�s also overseen by a Historic Commission. Three hundred shops and restaurants, two hundred daystall tenants (farmers, small food producers, artists and craftspeople), and a cadre of street musicians cater to ten million visitors a year�both locals and tourists�all on nine acres. The Market is also home to three hundred residents. Put that many people in close quarters, smack between a busy waterfront and a hustling downtown, and stuff happens. 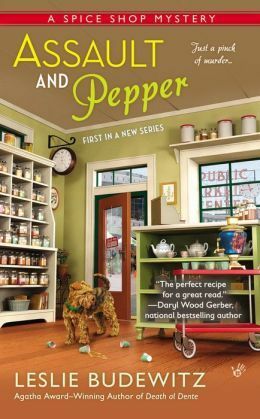 When her life fell apart right after she turned forty, Pepper Reece bought the Seattle Spice Shop. With it came a spicy variety of employees, customers�from brand-new cooks to professional chefs, suppliers, and Market neighbors. It�s the perfect crucible for human conflict. (Not to mention the bike cop on the Market beat, the ex-husband she left after stumbling over him and a meter maid�she still can�t say �parking enforcement officer��practically plugging each other�s meters in a back booth in a posh new restaurant, on an evening he was supposed to be working an extra shift.) Employees and customers look to Pepper for her expertise in food and spice, and because of her thirteen years working HR in a major law firm, her people skills. A Seattle native, she knows the city inside out, but still finds herself surprised nearly every day. Urban geography can be a challenge. Seattle�s neighborhoods cover half a dozen hills, joined�or separated�by two major lakes, a ship canal, and oodles of bridges. And of course, there is that waterfront. Directions are iffy. Characters live all over the city and its suburbs. Introducing the readers to a place I love, without losing them on the biways, takes some focus. In Jewel Bay, as in my own small town, characters run into friends�and enemies�all over. Even killers need groceries. When I lived and practiced law in Seattle, I got to know my regular bank tellers, produce sellers, and Nordstrom clerks, of course, but I rarely ran into a client, a witness, or even another lawyer while strolling through the Market or walking around Green Lake with a friend. Putting Pepper in the center of a close, well-defined community gives her the contacts she needs to ask questions and probe relationships. And she regularly calls on a former legal assistant (now a mystery bookseller!) and a law librarian for research assistance. The best part about this setting, though, is that I get to spend hours every day in Seattle, while sitting in my woodland home in Montana. No�call that second-best. Because what I love most is taking my readers on a virtual tour of the places I know and love and have, at different times, called home. So pour a cup of coffee or spice tea, and come with me to Seattle. I hope you enjoy the trip as much as I have. After leaving a dicey marriage and losing a beloved job in a corporate crash, Pepper Reece has found a new zest for life running a busy spice and tea shop in Seattle�s Pike Place Market. Her aromatic creations are the talk of the town, and everyone stops by for a cup of her refreshing spice tea, even other shopkeepers and Market regulars. But when a panhandler named Doc shows up dead on her doorstep, a Seattle Spice Shop cup in his hand, the local gossip gets too hot for Pepper to handle�especially after the police arrest Tory Finch, one of Pepper�s staffers, for murder. 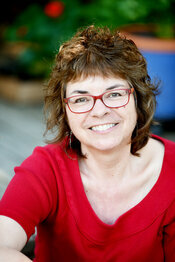 Leslie Budewitz is the only author to win Agatha Awards for both fiction and nonfiction�the 2013 Agatha Award for Best First Novel, for DEATH AL DENTE (Berkley Prime Crime), first in the Food Lovers� Village Mysteries, and the 2011 Agatha Award for Best Nonfiction, for Books, Crooks & Counselors: How to Write Accurately About Criminal Law & Courtroom Procedure (Quill Driver Books). She lives in northwest Montana with her husband, a musician and doctor of natural medicine, and their cat Ruff, a cover model and avid bird-watcher. Coming in July 2015: for BUTTER OFF DEAD, third in the Food Lovers� Village Mysteries! Readers, what's your favorite cozy spot? Leave a comment below for your chance to win a copy of ASSAULT AND PEPPER. My favorite cozy spot is snuggling in my hubby's arms. I love cozy mysteries with recipes. Looking forward to reading your book. wine, depending on the time of day. be a big hit!! Loved your posting, too!! beagles and read this cozy. Cute book cover. Sounds like a great book. My favorite spot is my comfy chair with a blanket and a good book. i love to curl up in my chair and have the dogs on my lap. computer screen as I work on the next installment! There's a love seat in my kitchen that belonged to my mother. I can look out to the sunny back yard. I love to sit there and read, knit, or check out Facebook. My favorite cozy spot is anywhere with good lighting. In a small cramped apartment, everything is adaptable to being a cozy spot. would love to read this first book in her new series My cozy spot is almost any place in my house chair, bed, yard and the bath tub. My recliner with my feet up. My favorite cozy spot is right in the corner of my couch with my cat. At the end of the day with everything done ,my cozy spot is my bed . In the winter my bed is warm and cozy , I prop up all the pillows and read till I can no longer keep my eyes open. I sometimes awaken myself nodding . LOL Then I put my book down and fall asleep quickly . fish pond (and in CA so good weather!). Cozy is as cozy does! Thanks to you all for stopping by! My favorite cozy spot at the moment is my bed. cats. Would love to read this book!! My favorite cozy spot is snuggled up under my heated throw in a recliner with a great book to read. with the soft blanklet he bought me. Great title for a book. Feet up on my corner couch, close to the window for extra natural light for reading and a convenient windowsill for whatever I'm sipping at the time. wherever the author leads me. My favorite spot is snuggled into my lazy boy recliner with a nice fuzzy blanket. On the sectional, feet propped up, with my two cats snuggled by me. During the winter I love to read beside the fireplace and in the summer I relax in my comfy recliner. I love to read cozy mysteries in bed. me here at Fresh Fiction! I like to watch television while in my husband's old chair, but whenever I want to read a book, regardless of whether it's afternoon or night, I crawl into my bed. I love to sit on the sofa with my favorite soft blanket, one or both cats snuggled next to me, a cup of tea and an engrossing cozy mystery! If I didn't work I could just hibernate all winter/all year like this!! such a great place for reading ! My cozy is a big chair with a quilt, cat and a good book! A cozy place to read is in bed with my kitties. to read. Cat and mouse sort of. A must read!! !